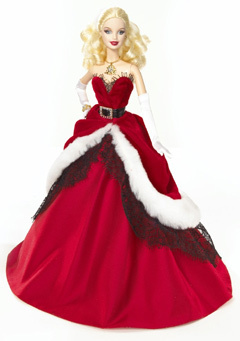 2007 Holiday Barbie was the "Miss Claus" Barbie. She is wearing a red velvet strapless gown with a full skirt. It is trimmed with white fur and she has a black belt trimmed in crystals - just like Santa's suit, except hers is also trimmed in black lace. She is also wearing long white gloves and has a golden necklace, bracelet and earrings. Instead of a Santa hat, she has a white fur headband. Her box is has a gold background and is accented with white snowflakes and writing. There is an African American version of this doll. 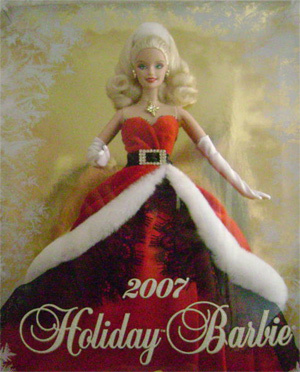 There was also a 2007 Hallmark Holiday Barbie Ornament.